The month of June will feature two special guest webinar sessions guaranteed to educate and inform! 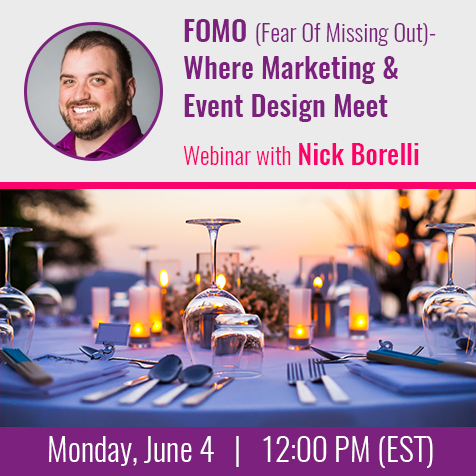 On Monday June 4 at 12:00 PM (EST), join Nick Borelli for a webinar session on FOMO – Where Marketing & Event Design Meet. Successful event design gives attendees the backdrops and contexts that enables them to show off their passions and values to their friends. How will your next event fulfill the lifestyle needs of those living in the experience economy while also empowering your sponsors to meet their goals? Strategic design can transform attendees into mass influencers if you are willing to be inspired by examples from some of the most successful events in the world. Regardless of your budget, you’ll come away with new ideas you can apply to your next event that will ensure those who didn’t attend this year will never make that mistake again. 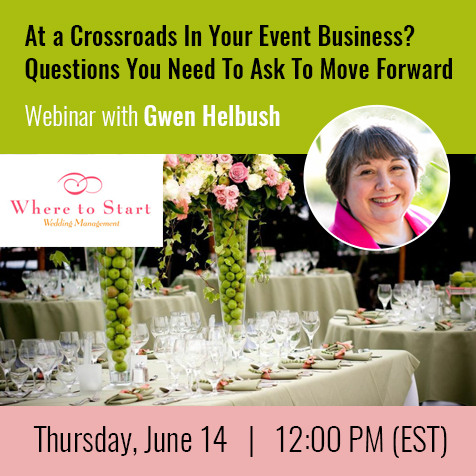 On Thursday June 14 at 12:00 PM (EST), join Gwen Helbush of Where To Start Weddings for a webinar session on the important questions to ask in order to move forward. Should you start your own business? Is it time to hire employees? How to say NO? These are some crossroad questions you may be facing. Join Gwen Helbush who will help you to find your answers.